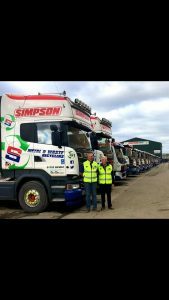 Simpson Environmental Services was formed by Jeff Simpson in 2001, in Slough, Berkshire. The company started with three grab vehicles on a piece of waste ground, installed a weighbridge and started to grow, in 2002 they purchased their first skip vehicle and then the articulated vehicles in 2004. The grab and skip vehicles customer basis is about 30 mile radius from site. The articulated vehicles move the non-recyclable to landfill. The site now has a modern recycling station, installed with new machinery three years ago and also an aggregate yard. We came across FORS when tendering for work in and around the local area. We realised it would help us to achieve best practice and benefit us by utilising the classroom and online training offered to help improve road safety for vulnerable road users. We achieved our initial Bronze FORS accreditation in November 2014 and continued to implement the effective procedures throughout the company. We have seen a change in our fuel management and have introduced a training plan for all drivers for the FORS on-line e-learning modules. Mark Willis the Transport manager has also completed the FORS Practioner courses. As a company we feel that the high standards that FORS sets has helped us to achieve the status of a quality operator. All our drivers complete the Safe Urban Driving Course. We have also invested in vehicle safety systems cameras, nearside proximity sensors and audible alarms for all our vehicles. All our drivers have also completed FORS E-Learning modules. Silver standard is a level to which we had aspired ever since achieving our Bronze accreditation. We have utilised all tools that are provided by FORS such as e-learning and safe urban driver workshops, all our drivers complete the Safe Urban Driving Course within three months of joining the business which has helped to improve driver skills and awareness of vulnerable road users. We have seen a 1% improvement in fuel usage in the last qtr, kept incidents to Nil and a slight improvement on PCN’s. We have developed an ongoing strategy to driver recruitment to ensure that we recruit the right people and identify any internal development opportunities for existing staff also we list vacancies within the local newspaper, job centre plus and on our social media page. We have found a Noise Monitoring Application, this allows us to record and monitor the noise levels of our machinery and vehicles keeping the health & well-being of our staff at the front of our minds. We have looked into modal shift and alternative vehicles for our operation. However, our research with our vehicle suppliers indicates that nothing suitable for our requirements is currently available. We plan our deliveries and collections to minimise the empty running of vehicles, monitor fuel usage as seen above to increase driver MPG, reduce our fuel costs and the impact of harmful emissions on the environment. 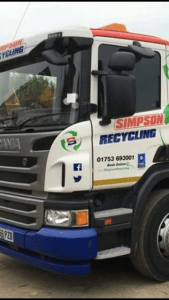 FORS has given Simpson Environmental Services the ability to effectively implement various strategies to ensure the company and its vehicle fleet operates as safely as possible. It has given us a solid structure that ensures we are as up to date and current as we can be and has given us access to tools such as e-learning and on-site courses that we would otherwise be unaware of. Moving forward, we will continue to maintain the highest levels of compliance wherever practicable. Becoming a Gold accredited member will ensure we are seen as having high standing within our industry including amongst our peers. In summary, we are seeing the benefits that ongoing training to reach FORS standards of performance can bring to our team of drivers. For the future, we aim to continue to ensure our ongoing development as a company continue to reflect the standards which underline the high standards which the FORS scheme represents.